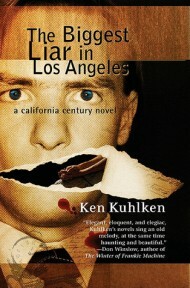 This week we have a guest post by mystery author Ken Kuhlken, who is the author of the Tom Hickey series, the latest of which is The Biggest Liar in Los Angeles which we reviewed earlier this year along with some other music related mysteries. Ken shares some interesting religious history he learned while researching The Biggest Liar, and his thoughts on what he found. Last year, while researching for my novel The Biggest Liar in Los Angeles, I got moved and excited by what I was learning about the two revivals that play a part in my story. And as I added that knowledge to what I had taken from a revival I witnessed, I sensed the solution to a mystery. I’m no genius, systematic historian, or theologian. My solution could be flawed, even ludicrous. Still, in case I’m on to something, I’ll go public with it. I had known little about the Azusa Street mission or Aimee Semple McPherson. Last year, I began to see how and why God used a descendent of slaves and a restless Salvation Army woman to deliver the power of the gospel to millions. In 1904 and 1905, while churches in Wales, Minnesota, North Carolina and Texas were reporting occurrences of speaking in tongues and supernatural healings, William J. Seymour became interim pastor for a small holiness church in Houston. A visitor from Los Angeles, after hearing Seymour preach, returned to her home church and arranged an invitation for him. Seymour arrived in Los Angeles on February 22, 1906. On a Sunday, his third day in the city, he preached a sermon that contended speaking in tongues was the first Biblical evidence of the inevitable baptism in the Holy Spirit. A week later, he arrived at the church to find the door padlocked. But some members approved of his preaching and his doctrine. He began holding Bible studies and prayer meetings at a private home. White families from local Holiness Churches heard reports and came to join in. On April 9, 1906, after five weeks of Seymour’s preaching and prayer, and three days into an intended ten-day fast, Edward S. Lee spoke in tongues for the first time. Soon many others, including Seymour and his future wife Jenny, also spoke in tongues. News soon reached African American, Latino, and White residents of the city. Seymour and others preached from the front porch of the Asberry home on Bonnie Brae Street to an audience from many income levels and religious backgrounds. The crowd grew until the porch collapsed. The group found a home at 312 Azusa Street, in a “tumble down shack” which had served over the years as an Episcopal church, a wholesale house, a warehouse, a lumberyard, a stockyard, a tombstone shop and, most recently, a stable. Seymour and helpers cleaned and made benches from planks resting on empty nail kegs. Because of the low ceiling, they didn’t raise a platform. Soon anywhere from 300 to 1500 people would attempt to squeeze in. Among them were men, women and children, black, white, Hispanic, Asian, rich, poor, illiterate, and educated. While believers and the curious from around the world began to appear, the intermingling of races and the group’s encouragement of women in leadership outraged many citizens. 1906 was the height of the “Jim Crow” era of racial segregation, and fourteen years prior to women’s suffrage. Pastor Seymour and his followers held to five core doctrines: salvation by faith; sanctification of the believer; tongues as evidence of Spirit baptism; faith healing as part of God’s plan for witness and redemption; and the “very soon” return of Christ. Established churches joined in the condemnation. Preachers warned their congregations to stay away, claiming the movement was hyper-emotional, and that it misused Scripture and lost focus on Christ by overemphasizing the Holy Spirit. Some called the police with complaints about the apparent chaos. Visitors returned to their home churches and reported that blind people had their sight restored, diseases were often cured instantly, and immigrants were spoken to in their native language by uneducated members of the congregation. Among the visitors was Chicago pastor William Durham, who would play a role in a subsequent revival. In 1908, not long after Pastor Seymour’s marriage to Jenny Moore, Clara Lum left the mission, moved to Portland, and took the magazine with her. By then, most leaders from Azusa Street had spun off to form other congregations around the country, usually among immigrants and the poor. Doctrinal differences spawned denominations. The Church of God in Christ was formed in 1907, the Assemblies of God and United Pentecostal Church in 1914. Today, with more than 500 million Pentecostal and Charismatic believers across the globe, the Azusa Street Revival is commonly regarded as the beginning of the modern-day Pentecostal Movement. While the revival on Azusa Street caught fire and spread, Aimee Semple McPherson grew up in eastern Canada, exposed to faith through her mother, a Salvation Army officer. In December 1907, seventeen-year-old Aimee met Robert James Semple, a Pentecostal missionary from Ireland, at a revival meeting. After Aimee’s conversion to Pentecostal faith and their brief courtship, they were married on August 12, 1908 by Robert’s mentor, Willam Durham, the Chicago pastor and evangelist who had often worshipped and preached at the mission on Azusa Street. The Semples felt called to become missionaries in China. Shortly after they arrived in Hong Kong, both contracted malaria. Robert died. Aimee recovered and gave birth to her daughter Roberta. After recuperating in the states, Aimee joined her mother in soup kitchen work with the Salvation Army. While in New York she met Harold Stewart McPherson, an accountant. They married and had a son, Rolf. But settling down didn’t agree with Aimee’s nature. During a grave illness, she felt the undeniable call to preach and evangelize. She took to the road and held tent revivals up and down the eastern United States. Her revivals were often standing-room-only. She became known as a faith healer because claims of deliverance from afflictions increased her audience. But preaching, not healing, was her passion. In 1916 she toured the southern United States in her “Gospel Car,” a 1912 Packard emblazoned with religious slogans. Standing in the back seat of the convertible she gave sermons over a megaphone. On the road, while her husband or her mother drove and cared for the children, she sat in back typing sermons and articles. By 1917 she had founded a magazine, “The Bridal Call”, for which she wrote about women’s roles in religion and the marriage bond between Christians and Jesus. The magazine contributed to the rising women’s movement. Although her husband made efforts to join her travels, in 1918 he filed for separation. His petition for divorce, citing abandonment, was granted in 1921. By this time, Aimee had settled in Los Angeles, weary of constant traveling and moved by a desire to give Roberta and Rolf a home. During the next few years, she created her Angelus Temple with funds she raised by traveling the country to preach in crusades and smaller meetings. She preached in a boxing ring, before and after the match, on the topic “Knock Out the Devil.” In San Diego’s Balboa Park, the National Guard was called to control a crowd of over 30,000. She preached in speakeasies and evangelized in brothels. Angelus Temple rapidly evolved into its own denomination, the International Church of the Foursquare Gospel, which focused on Christ as savior, baptizer with the Holy Spirit, healer, and coming king. Sister Aimee continued to welcome all, regardless of social or cultural differences. She was the darling of Gypsies. A band of Klansmen attended a service in their costumes. As a result of a sermon Aimee spontaneously preached, after the service hoods and robes were found littering nearby Echo Park. She assisted Hispanic ministries in Los Angeles, opened the temple commissary to the poor, ran soup kitchens, free clinics, and other charities. During the Great Depression her ministries provided more help to the struggling of Los Angeles than did the city government or any other institution. Aside from founding the Foursquare churches, her influence lives in many denominations. Chuck Smith, once a student at Angelus Temple Bible School, founded the Calvary Chapels, and played a leading role in the Jesus People revival, a movement to which I can bring some witness. The Jesus People movement began on the West Coast of the United States in the late 1960s and spread primarily through North America and Europe, growing out of the hippie culture. Members of the movement were often called Jesus freaks. The movement was partly a reaction against the counterculture from which it originated. Young people, disenchanted with post war complacency and consumerism, flocked to hippie doctrines and attitudes, but often discovered that drugs, sexual liberty, and freedom from tradition hadn’t led to enlightenment. So they turned to Jesus. The movement sought to return to the practices of early Christians. As a result, Jesus people commonly viewed churches as apostate. Their theology called for a return to simple living. They believed in miracles, signs and wonders, healing, prayer, and works of the Holy Spirit. Like the Azusa Street founders and Sister Aimee, a core belief of Jesus people was acceptance of others, regardless of their peculiarities. While most churches either remained aloof or actively opposed the movement, the few that welcomed even the strangest and most bedraggled flourished. I grew up a skeptic, but events surrounding the death of my closest friend and some months hitchhiking around the country provided more insights and questions than my skepticism could process. At a Billy Graham crusade, I made a profession of faith. Then I attended a variety of churches and got disillusioned, by a sermon that condemned some group or public figure I admired, by the wary or critical looks directed my way, or by the same kind of welcome I might receive upon entering a car sales lot. Whether by fault of those churches or of my proud and sinful nature, I didn’t meet God in them. Whenever the college evangelists asked was Jesus was my Lord and Savior, I said, “Yep.” They replied with, “What church do you go to?” From there, the conversation would deteriorate until I begged out or they gave me up as incorrigible. His name was Tony. He lived in a communal way with other Jesus freaks, down the hill from where I lived in a communal arrangement with other musicians and their wives or lovers. Before long, Tony was leading us in weekly Bible studies. Although the Jesus People revival lasted only a few years, its influence on Christian culture has been mighty. Thousands of converts moved into leadership positions in churches and other organizations. Its songs and worship changed Christian music. Some of the fastest growing denominations of the late 20th century, such as Calvary Chapel, Hope Chapel, and the Vineyard, trace their roots to the Jesus People. And the Jesus People were offspring of Azusa Street and Sister Aimee. Chuck Smith received his early training from Sister Aimee’s Church of the Foursquare Gospel, which also birthed the international Potter’s House Church. His Young People started as a home Bible study led by former Foursquare Preacher Dave Compton. Many His Young People converts are now church leaders. I couldn’t find the word in any of my dictionaries, even the OED shorter version. But it’s not hard to translate in context. I take it to mean, as we deal graciously with all sorts of God’s people, He will accordingly deal with us. The churches I’ve attended longest are evangelical. Their leaders often pray for revival. So I’ll suggest, whoever seeks a revival had better get more conviverous. In these churches, you won’t find anybody shooing away a person of color or a scraggly homeless fellow. But you can find the subtle persuasion toward homogeneity. You can hear or sense that we’re all in this life together as long as we walk and think in the same straight line. From what I know about Azusa Street, Sister Aimee, and the Jesus People, I’ll venture that God prefers us to acknowledge we’re all in this life together, period. And I suspect He would like us to see that revivals begin when we love even at the risk of severe discomfort such as may rise out of encounters with those who threaten our cultural prejudices, doctrines or politics. As I hope I’ve already implied, I’m not writing about church growth. Growth belongs to a single church. Revival belongs to the faith. Being a novelist without deep or broad knowledge of theology or church history, I feel inadequate to draw conclusions about such a weighty topic. Still, I’ll contend with deep assurance that church leaders who long for revival had best guide their people toward deeper love, free of judgment, toward love that appears outrageous in the world’s eyes. When God sees them offering outrageous love in His name, He may provide signs and wonders. Or healing, tongues, or instant conversions. Or art, or music too sublime to be of this world. And skeptical outsiders will witness these wonders and flock to Him. Not to belong to a church, but to share in the outpouring of His spirit. If I were a church leader seeking revival, I would look for ways to enlist my congregation in a prayerful and passionate quest for opportunities to offer love that appears outrageous in the context of their culture. God, not leaders, makes revivals. But God makes revivals when people exhibit their willingness to imitate the ways of His conviverous soul. Remember, the revival Christ brought wasn’t accomplished through doctrine, miracles, or persuasion, but by His demonstration of the most outrageous love. Loved this article. As teens, my mom and aunt attended Aimee Semple McPherson’s church. My mom played the piano for the Sunday School classes and my aunt played the violin. They both loved that experience and became avid church goers. My mom and dad worked at the first Billy Graham crusade in Los Angeles. The little church I go to now, So. Baptist, feeds the hungry, pays people’s electric bills, finds them places to live, etc. Many of our faithful are recovering from one addiction or another. It is a working church.